"This is a dream come true, do not hesitate, this is what you have either always wanted or needed." "Wasn't sure if this was for bread and baking alone, so I made a meatloaf in it. Using the same old recipe, after the second time, the family com..."
"I have been baking bread for a lot of years. My bread pans were in need of replacements. I accidentally discovered there were cast iron loaf pa..."
"Wasn't sure if this was for bread and baking alone, so I made a meatloaf in it. Using the same old recipe, after the second time, the family commented on how great the meal was tonite. I'm sold!! A little more challenging to clean than a skillet, but cast iron care was easy." "I have been baking bread for a lot of years. My bread pans were in need of replacements. I accidentally discovered there were cast iron loaf pans available, and being a big fan of cast iron skillets and dutch ovens, I just had to give them a try. I never knew the material a loaf pan is made of could make such a difference. My bread come right out of these pans simply by turning them over, thanks to the wonderful factory seasoning. The crust on my loaves is very even and the interior of the loaf is perfect. I will never bake bread in anything but cast iron ever again, and Lodge has to be the current king of cast iron." "I love them.I baked bread in them and it came out fantastic.I would recommend them to anyone,and the price was great too! I am looking into buying one for biscuits." "I had been shopping around for these when a fellow cast iron enthusiast passed a link along to me for Katom. And I couldn't be happier that he did! They have the best prices by far! Shipping was also surprising fast as well! My new Lodge loaf pans worked perfectly right out of the box,both loafs of bread fell right out,& ya just can't beat the way cast iron preforms & gives that "Down home" flavor!" "Lodge does not disappoint. Every item I order from here is first quality." "Bread pan is excellent for all bread baking." 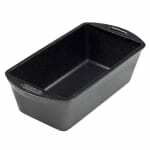 "Purchased 2 of these loaf pans for baking breads and of course for meat loafs (one of my favorite things to prepare and eat) My only draw back to these 2 pans are they are just a little small. But they are awesome they do all the legendary things that Lodge cast iron does. I love cooking with my cast iron. Have several pieces of the Lodge cast iron and plan to add to my collection." I will be purchasing again!!! "Great service, Great Product, Quick Delivery." "These pan are great for different breads. I have used them at least 10 times. Had to get use to the pans since they are not cheap tin but good cast iron. Will use them for many years and the good things is they get better as they are used. The quick service will make me shop more as needed." "Love my cast iron, these go great with my collection. Love them!!!!" "These cast iron loaf pans are wonderful. It is no trouble to place several in the oven at the same time and just bake. Because of the even heating you don't have to be as concerned about hot spots in the oven. Clean up is a breeze. Just remember to place a paper towel between each loaf pan when storing them to prevent moisture and rust." After trying many, this is the best. "I've tried several different styles of loaf pan: glass, plain aluminum, nonstick aluminum and these. These cast iron pans are virtually non stick and brown perfectly. The only drawback is that they are heavy for a bread pan - still not heavy enough to bother me. The trick with getting a brown crust below the ridge of a baking pan is a dark color on the pan itself (something to do with heat reflection). So if you use glass or plain aluminum, you will end up with only light browning on the sides. Nonstick aluminum pans are the only ones I've found (besides cast iron) that give you the correct browning, at least in a home oven. I don't like using non stick because they eventually break down / scratch and I don't like the idea of silicon or whatever in my cooking. So I found these by process of elimination and haven't looked back. Gotten several for gifts as well. As an added bonus, like most well cared for cast iron, they are a breeze to clean (no soap, stiff brush and water) and can be just as non-stick as Teflon. Did I mention that they will last forever?" "PRICE FROM YOUR COMPANY IS ALWAYS THE BEST." "Awesome product...fast delivery...washed loaf pans....immediately baked 3 loafs of bread and one meatloaf same day...absolutely wonderful. Somewhat smaller pans..bought pre-made bread dough loaves...cut in half lengthwise...let rise in pans..and bake..!!!" "Cast iron takes a little while to get used to, but its really the best. Lodge is the last American Mfg of cast iron and the best avail. Katom had the best price." "great product, a little difficult to clean. great price and fast shipping." The Best Ever Loaf Pan! "I ordered several of these to give as Christmas gifts and decided to try them out first. I am amazed at the even browning and cooking without having to turn your pans half-way through the cooking cycle. A quick wipe with a damp cloth and they are ready for the next time you need them. These loaf pans are the absolute best way I know of to cook bread, pound cake, or a moulded meat loaf. I'm ordering more of these. They are fantastic!!!" "We make our own fresh ground wheat bread, cooking it in these pans just makes it all the better! Lodge makes the best cast iron on the market and Katom has awesome customer service and best price. Folks who are afraid of cooking with cast iron just miss out." "great pan. have already cooked meatloaf and banana bread in the pan and both came out perfectly." "I ordered these cast iron loaf pans for our daily bread making and they are fantastic! We uses a lot of cast iron and I am thrilled to add these to our collection. Made in the USA, pre seasoned and the best price around. We use them everyday!" "Rock solid, even heat distribution and made in USA"
"Bake bread with these and it's perfect. I can't find Lodge Loaf pans anywhere near this low price anywhere. Thanks KaTom." "These pans are great. My breads come out consistantly cooked every time no hot spots no burning or uneven cooking." "MAKES A VERY ATTRACTIVE LOAF OF BREAD!" "Great Product and really, really, great price. Can't find Lodge cookware anywhere for KaTom's price." Focus 900495 1.5lb Open Top Bread Pan, Glazed Aluminized Steel, 12.25 x 4.5"